Describe an advertisement you have encountered that was personalized to you: What visual or text elements do you recall about the ad, and how did the personalization affect you? An ad that was “personalized to me”. That is a tough one, for you see all ads are made for everyone. But if I had to choose one it would most likely be the Old Spice commercials. My reasons consist of the fact they are short, get the point across, have a variety of humor, and a bunch of moments where you go “What the #@$&?!”. I will also have to admit that I love to smell good, nobody wants to be around someone that smells of sweaty man stench. I enjoy humor and I enjoy the way that Old Spice has incorporated all the things that I enjoy in life. Plus the way that the Old Spice man holds himself is just something you have to respect. But then again this is just my personal opinion. Posted in Discussion Week 9, Unit 3 (Unit Three). I was kind of confused when I was trying to figure out what I wanted to put for my example of an advertisement for this question. My roommate started talking about examples in his life and it spurred me to think about Facebook. 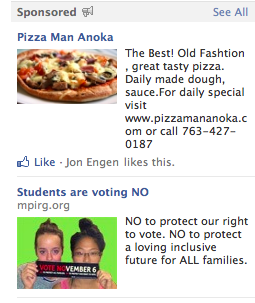 On the side of Facebook’s page I see personalized adds that are very relevant to my life. For example, I see a picture of delicious food and an explanation to the side of it. The catch is that the title says, “Pizza Man Anoka”. I am currently in Eau Claire, Wisconsin but my hometown is in Anoka, Minnesota. Another advertisement I find is one that says “Vote No.” The reason that this advertisement correlates to me is that Minnesota is voting on two constitutional amendments this election cycle. One is for determining the definition of marriage and the other amendment is a voter ID amendment. In their picture advertisement they have two young teenage girls holding up a sign by their mouth. I see that they use young teenage girls to represent my age has a voice in this election. I also find it neat that they have it by their mouth as to say “You can say no.” The personalization in this advertisement is clever and well though out, but it does not affect me in a grand way. My views and beliefs on both amendments, and the fact that I voted early, outweigh the message they are trying to portray to me at this time. I like the advertisements that grasp your emotions. When I see the ASPCA commercial for homeless animals in shelters I feel my emotions well up. They play a sad song, show terribly sad pictures and ask for you to help. Bam! Convicted, though I haven’t contributed yet. For me, playing with emotions in an advertisement will grasp my attention to the message way more. You can play a song; show pictures, videos, etc. I would probably have a better feedback, but still minimal, since I do not often respond to every advertisement. Posted in Discussion Week 9. It feels like this advertisement’s target audience is me. It’s for women who are athletes that don’t care what their body looks like as long as it accelerates them through their sport. The ad focuses specifically on knees. I have a very close connection to knees because I had surgery on my left one and was out from my sport of 8 months. Now that I’m healthy I don’t care what my knees look like as long as they are healthy too. The visual element was the picture of the scarred, skinned up knees for all to see. I have an ugly scare on my left knee and I’m not afraid to show it off. The text element of the ad is really what seems to be personalized for me too. It describes my family, my personality, and my idea of a great man. Even though my sport is not soccer I still feel a strong personal connection to this ad. How did the personalization affect me? Well, let’s just say my running shoes and flip-flops are Nike, I have an entire running outfit that is Nike, and 3 shirts that are Nike. I would say that ad along with other Nike ads have been very effective on me. An ad that felt personalized to me was the new commercial for Apple’s Ipods. I have an extremely old Ipod and have been wanting to get a new one for sometime. The commercial immediately clicked with me because the Ipod comes in my favorite color, electric blue! The comerical also has the Ipods bouncing around to a song so it makes it seem really interactive and fun, this is probably going to be one of the Ipods I actually choose to buy. This is a great example of device convergance. I love that the Ipod combines so many things from an MP3 player to be able to play video games, write notes, or even go on the internet . Being a music lover, an advertisement that really catches my attention needs music that I enjoy. In a way this can be famous person testimonial seeing as the musicians are celebrities as well. One commercial that was directed at me-me being the targeting audience- was a NASCAR commercial done in 2006 by the famous band “The Red Hot Chili Peppers”. Being a long time fan of the band, I am instantly drawn in by actual concert performance displayed during the commercial. You can see how the camera will quickly change from the large audience at the concert to the audience at the races as if saying Red Hot Chili Peppers and NASCAR fans go hand in hand. The band members are shown having a great time, dressed up in racing gear, signing guitars and taking pictures. Obviously making money off of this commercial, the band is trying to convince their fans that NASCAR is something they enjoy, so you should enjoy it as well. (Even though i’m not entirely sure they do enjoy NASCAR themselves..) Now i’m not a fan of NASCAR myself, but the fact that the Chili Peppers were on the commercial made me watch the entire thing- which is the ultimate goal of advertisements.